Why don’t you all go with Jerusalem observance of the new moon for unity’s sake? Yahshua saith unto her, Woman, believe me, the hour cometh, when ye	shall neither in this mountain, nor yet at Jerusalem, worship the Father. Ye	worship ye know not what: we know what we worship: for salvation is of the	Jews. But the hour cometh, and now is, when the true worshippers shall	worship the Father in spirit and in truth: for the Father seeketh such to	worship him. Elohim is a Spirit: and they that worship him must worship	him in spirit and in truth, John 4:21-24. The temple was destroyed in 70 A.D. and worship now is where	two or more meet together: For where two or three are gathered together	in my name, there am I in the midst of them, Matt 18:20. And Yahweh spake unto Moses, saying, Speak unto the children of Israel,	and say unto them, Concerning the feasts of Yahweh, which ye shall	proclaim to be holy convocations, even these are my feasts. Six days shall	work be done: but the seventh day is the sabbath of rest, an holy convocation;	ye shall do no work therein: it is the sabbath of Yahweh in all your dwellings. These are the feasts of Yahweh, even holy convocations, which ye shall	proclaim in their seasons, Lev 23:1-4. The command of keeping a “holy convocation” literally means	that we are to be meeting together to keep any of Yahweh’s	commanded moeds (Appointed Times). In the future Kingdom it	will be in Jerusalem (Isa 66:23; Zech 14:16), but for now we do the	best we can with Yahweh and Yahshua’s help, in Spirit and in	Truth. Why not just use calculations from the United States Naval Observatory to figure out when to keep Yahweh’s Feasts? We actually do in preparation for the next year’s Feast days, but	we still practice the ancient ways of looking for the new moon. They	didn’t have the technology we have today. And we may not either,	in the near future. One may know when the time is estimated for the setting of the	sun on a Sabbath, but mechanical watches can break. We should	wait until we actually see the sun setting down below the horizon	before declaring a new moon day. We could lose Internet and	phone services due to tribulation or other reasons. Even so, we	will still need to keep Yahweh’s Appointed Times. We all need	to be practicing these things in obedience. It may be a big test for	many, one that prayerfully we’ll all pass. We are to observe those	“lights” that Yahweh put in heaven for a reason, Gen 1:14-19. Psalm 81:3 – I noticed in some versions that the “full moon” is	mentioned. I know that this could have been added, especially	since I was not able to find another scripture about it. The Ryrie Study Bible’s note points out the 81st Psalm is	associated with the Feast of Tabernacles. That is a special time on	Yahweh’s calendar. Four of the seven “moedim” Feast days occur in	this month. It is a glorious time of deep repentance followed by the	good news of the first resurrection and then the promise of the	coming Kingdom. This new moon (also translated month) is the	“fullest” of monthly blessings for the faithful. Instructions given for observing Tabernacles and Atonement are	based on observance of the new crescent moon. So why mention the	“full moon”? Most likely this is a poetic or exuberant expression of	expectations of the final feast of the year. It is “full” of good news. Why do you have North America as a regional sighting area, can’t it	be divided into smaller areas? Wouldn’t Alaska, for example, be	large enough for a separate new moon region? At certain times of the year it would be impossible to see the new	moon from that far north. Alaska will have constant sunlight, in	parts of the year, as the sun seems to float along the horizon around	in a flat clockwise movement. In such situations it is has been	agreed that it would be best to default to another area (further	south) where brethren could confirm the new moon. The idea that	Yahweh desires mercy and not sacrifice comes to mind. It has been the common understanding and agreement among	most of the major Sacred Name Assemblies in the United States, for	example, to allow two or three reliable witnesses (Deut 19:15; 2 Cor	13:1) to confirm a new moon sighting wherever they may be within	the nation, even though they may be in different time zones. The	United States has four time zones, while other countries may have	only one. It seemed appropriate to make all of North America	inclusive for the reasons stated. Those from different areas or time	zones will travel to the sojourning Feasts such as the Feast of	Tabernacles in obedience to Yahweh. 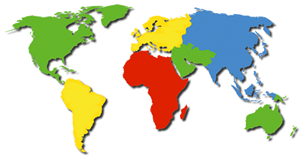 Besides the North America	region, there would be the regions of South America, Europe, Asia,	Africa, Australia, and the Middle East . What if I travel to a different county to keep the Feast of	Tabernacles, will I need to still observe the biblical calendar	according to my region? Sometimes it’s best to answer a question with a question. If one	was to travel to a different country would they keep the 7th day	Sabbath according to their own region or the region that they come	into? The answer would obviously be the region that they came	into, and it would be the answer to any other Appointed Times. The	weekly Sabbath is from Friday night sunset to Saturday night sunset	wherever you may be. Why do you not go with a regular calendar? And Elohim said, Let there be lights in the firmament of the heaven to	divide the day from the night; and let them be for signs, and for seasons,	and for days, and years, Gen 1:14. • Lev 23:10-11 Wavesheaf (first fruit offering) of barley	offered during early Spring. This is done in the first month	of Yahweh’s calendar, verses 4-5. • Ex 9:31 7th plague of hail destroys Abib of barley, just before	Passover occurred. Israel is looked upon for confirmation	for the early barley grain, since Isreal has been designated	as the “holy land” by Yahweh, Zech 2:12. • Deut 16:1; Ex 34:18 First month of the year is called, “the	month of Abib.” It’s in the Spring, not in the dead of winter.